VC scored 15 points and the Nets kept their playoff hopes alive for a couple more days by handing the Philadelphia 76ers their worst loss of the season, 96-67 Sunday night. Lou Will had 14 points to lead the Sixers. The 76ers had no other players in double figures in shooting 35 percent from the floor. Andre Iguodala and Andre Miller combined for 12 points on 4-of-17 shooting. The 67 points were a season low for Philadelphia and the 29-point loss was the worst defeat. With the loss the Sixers fall into the 6th spot in the East and a 1/2 game behind the Heat for that coveted 5th seed. The fifth seed will probably play Atlanta in the first round of the playoffs and the sixth will get either Boston or Orlando. The Hawks came into the Garden Wednesday night with a perfect season intact for a rematch of their Playoff series last year with the reigning champs, the Boston Celtics. It was one hell of a game and came down to the wire. 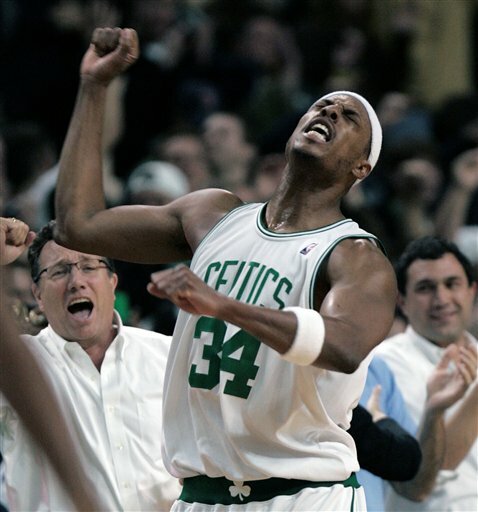 Pierce scored 34 points in all, Kevin Garnett had 25 with 12 rebounds and Rajon Rondo had 10 assists for the Celtics. Joe Johnson scored 28 for Atlanta, finding an open Marvin Williams for the go-ahead 3-pointer with 7.4 seconds left before Pierce answered at the other end, faking out a pair of defenders and sinking the game-winner. Boston moves to 8-1 on the season as Atlanta falls to 6-1. Well 215 fans, who woulda thunk it? Tonight, yyyyyour Philadelphia 76ers take on the Hawks in Atlanta, and with a victory tonight the 76ers will clinch a playoff berth. With the Sixers magic number at 1 over both the Indiana Pacers and New Jersey Nets, a win tonight and the Sixers are in for the first time since 2005, quicker then any of us imaged post-Iverson. It won’t be easy as the Sixers are on the road against one of the hottest teams in the NBA, a Hawks team that has won 9 out of their last 11 and are in a battle for the 8 seed in the East, also with Indiana and New Jersey. The man the Sixers will need to look to keep in check tonight is ‘The Game’ look-a-like, Hawk forward Josh Smith, who has been averaging 20 points, 6 boards, 6 assists, and 6 blocks a game during that stretch. If the Sixers do fall short tonight, they can still clinch today with a loss by BOTH the Pacers, in Milwaukee and the Nets, in Detroit. If the Sixers come up short tonight and either the Nets or Pacers win, the Sixers next opportunity to clinch will come tomorrow night, this time at the Wachovia Center against the same aforementioned Hawks.